Started on Earth Day 2017 (April 22), the March for Science in Washington, D.C. focuses on standing up for facts and science, defending the environment for future generations, and supporting evidence-based legislation on the top issues facing the nation and the planet. As the Trump Administration continues slashing funding for science-related government organizations and research, these issues could have a big impact on the health of Americans, the numerous National Parks and wildlife refuges, and the well-being of the environment in general. This large-scale public event includes participation by global policymakers, finance ministers, environment and development NGOs, industry executives and others. This year, a large crowd is expected to attend in the nation's capital, and additional marches will be organized around the country. In 2019, the March for Science will take place after Earth Day on May 4. In the past, the event started at 12 p.m. at the National Mall in Washington, D.C. and moving toward the Capitol beginning at 2 p.m.
Over one million protestors gathered in cities around the world on Earth Day in 2017 to stand up for science and the environment, and last year, crowds were reportedly a bit smaller. As a result, you should plan to arrive early or expect to be in the back section of the crowd. Even if you do, though, the National Park Service sets up Jumbotrons to expand visibility for attendees during large events on the Washington Monument Grounds and the National Mall. Be prepared for a security screening when you arrive at the National Mall. Prohibited items at the gathering include alcohol, bicycles, explosives or fireworks, glass containers, coolers, animals (except service animals), weapons, and several other dangerous items. You can, however, bring your own lunch, snacks, and beverages in plastic bottles or buy food and drinks from many vendors on site. The best way to get around the city is to use public transportation, and the closest Metro Stations to the National Mall are Smithsonian, Archives, and L' Enfant Plaza. If you're driving, there are also plenty of places you can park near the National Mall, but prices can be high and space limited, so arrive early and budget enough for the day. If you're looking for a place to stay after you're finished marching and socializing, there are several hotels near the National Mall, but be sure to book well in advance of the event as rooms are likely to sell out quickly. If you need to save money, you could try out some cheap hotels in the capital or head out to Northern Virginia or ​Maryland for some great deals on Bed & Breakfasts. Past Environmental Rallies in Washington, D.C.
Every few years, organizers like the Earth Day Foundation organize events on the National Mall in Washington, D.C. around Earth Day. 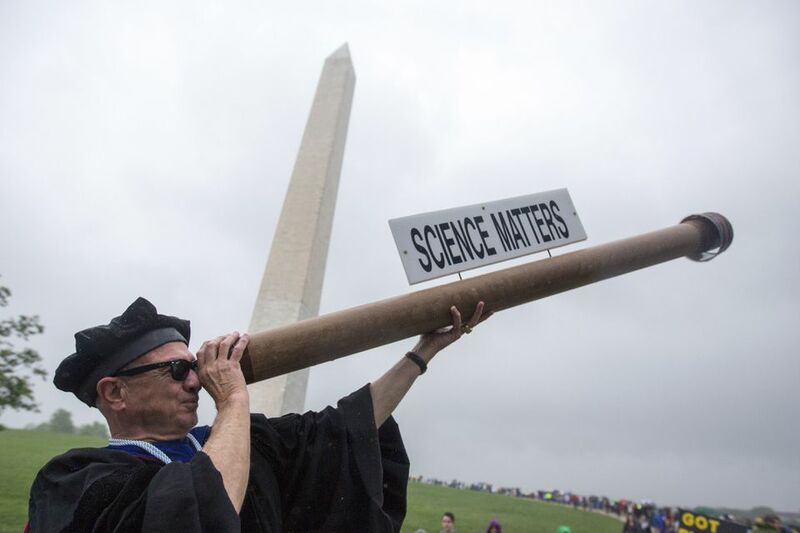 Along with last year's combination Earth Day and March for Science events, the nation's capital has also seen several other large celebrations. In 2015, the Global Poverty Project and the Earth Day Foundation partnered to organize a rally for the climate movement that also seeks a way to sustainably end extreme poverty and malnourishment. Will.i.am and Soledad O'Brien hosted a free concert headlined by No Doubt, Usher, Fall Out Boy, Mary J Blige, Train, and My Morning Jacket. The 2012 Earth Day event on the National Mall was a major day-long event to rally to "mobilize the Earth and demand a sustainable future." The event, sponsored by Earth Day Network, featured music, entertainment, celebrity speakers and environmental activities. Headlining performers included legendary rock group Cheap Trick, Rock and Roll Hall of Famer Dave Mason, and pop-rock bands Kicking Daisies and The Explorers Club. Speakers included the EPA Administrator Lisa Jackson, D.C. Mayor Vincent Gray, Rev. Jesse Jackson, Atlanta Falcons fullback Ovie Mughelli, Indy Car driver Leilani Münter, members of Congress including Reps. John Dingell and Edward Markey.